Sometimes you want a website design that visually has little to do with the actual practice while working to help ease stress and anxiety from the moment you land. 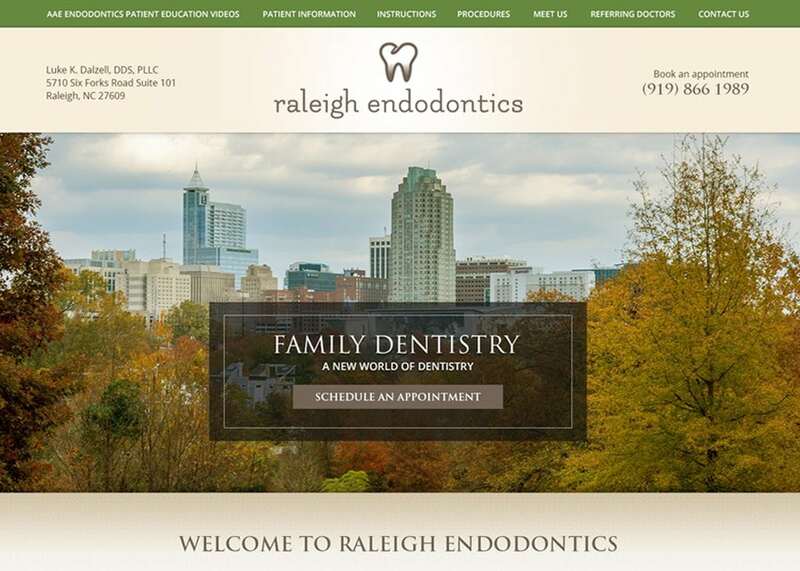 Dr. Dalzell at Raleigh Endodontics was looking for precisely that kind of design when he contacted Optimized360. Everything about the website is focused on helping to soothe the visitor’s nerves as soon as they arrive, from the soothing lush green to the shimmering light of a sunset over the water, Dr. Dalzell wanted his visitors to escape from their worries, and that’s precisely what this website accomplishes. Wholesome and relaxing were elements we were asked to work with, and we incorporated those from the very outset. There are warm, comforting tans and refreshing greens, soothing rays of orange and yellow sunlight and an uplifting nature scene. Visitors may be coming to this website to tend to their dental needs, but they need a moment to sigh away their dental anxieties first. After the initial impression, everything is easily accessible and provided with a pleasing presentation. Additional care is taken to present patients with the staff’s qualifications, including organizations they are a part of and endorsed by. These kinds of reassurances help to ensure the patient that the practitioner is a respected part of the dental community. Golds, greens, browns, and mixtures of them all are the foundation of this websites color scheme. These colors provide different impressions to the visitor, creating a sense of serenity that makes visiting the dentist seem not quite so terrible. A downplayed color tone is used to help build this element in the photo links to their procedures, while the testimonials are presented in a slideshow over a brightly lit field of beautiful orange flowers. A great deal of information is provided on this website, intended to help both inform the patient and help soothe them by answering their most pressing questions. From the links to the various procedures to the video information found at the bottom, patients are provided with everything they need to reassure themselves about their visit and set their minds at ease about the procedures to come. At the bottom of the homepage is a well-presented set of information, providing everything the patient needs to educate themselves about their upcoming office visit. Serenity is the calling card of this website. For those patients who have anxiety about dental visits, this website design is a panacea, tailored to approach their concerns and leave them without fear. The prominent placement of the social media links, as well as copious information about their practice and testimonials from previous patients also aid in this approach. This website reflects a dental practice that cares about your concerns and is conscientious of the fears that plague some patients. Here you’ll find a relaxed environment that will be like a breath of fresh air after visits to other offices, a low-pressure location where your comfort is a primary concern.